Here at Child’s World Academy child care, we know that getting out of the house in the morning can be a challenge and having to feed your child a healthy meal before you shoot out the door can be a task of Herculean proportions. 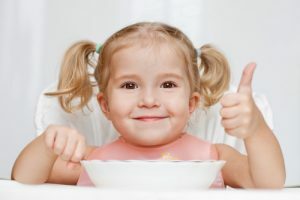 And if Cheerios are boring your child and the thought of making a huge breakfast of eggs, pancakes, and fruit salad is untenable on weekday mornings, try a few of these healthy, easy breakfast ideas for toddlers and preschoolers. Smoothies are a treat on a hot summer morning, and this key lime smoothie tastes like dessert but is packed with protein and antioxidants. Do your kids love mini waffles? Do you feel like they’re not getting enough protein when all they eat are mini waffles? Make a mini waffle sandwich with peanut butter in the middle! Maybe you’ve seen other parents serve their kid’s toast in the shape of hearts, stars, or circles, and have thought, “Does that really work?” It really does. Invest in some cookie cutters and serve up avocado toast tomorrow. These breakfast popsicles are healthy and aren’t full of sugar. They’re loaded with protein and real fruit, and your kid will definitely eat them. These mini muffins, made with peaches and honey, are a favorite among kids and can be baked on a Sunday night and served for breakfast all week long. Whip up a batch of no-bake, protein-packed, gluten free chocolate peanut butter breakfast bars, and enjoy a full week with no breakfast protests. Is your child tired of toast? Skip the bread and make open sandwiches with almond butter on bananas! This blueberry pie oatmeal really does taste like blueberry pie, but it’s full of healthy ingredients that will sustain your child all morning long. Want something easy and no-fail? Take a whole wheat tortilla, spread peanut butter on it, add banana slices and a sprinkle of chocolate chips, and you’ve got a breakfast your kid will devour. This whole grain breakfast porridge can be made in your slow cooker and batched out throughout the week! Do you have a breakfast idea that always goes over well in your house? Let us know about it in the comments section! If you are looking for quality child care in the Monroe, CT or Peekskill, NY areas, give us a call and schedule a tour of our facility.